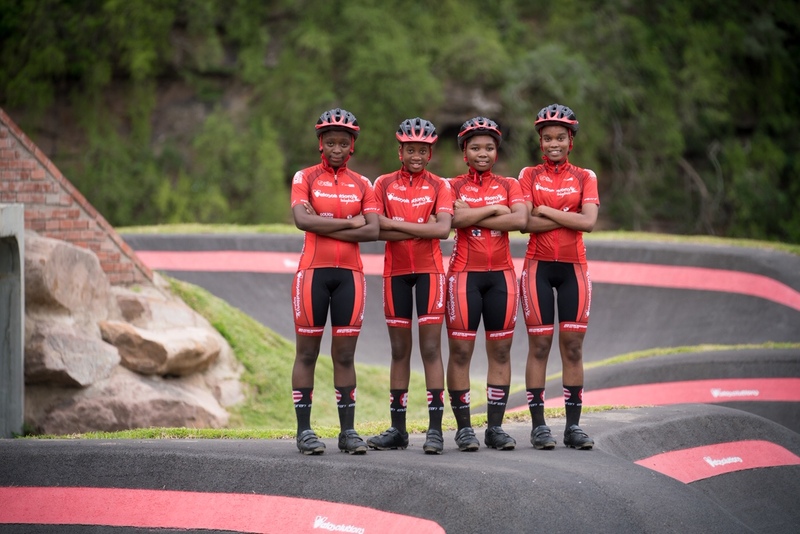 Meet South Africa’s first black female cycling team! 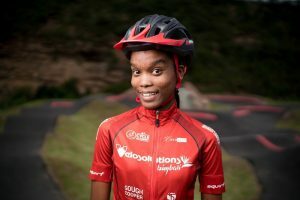 Further growing its #pumpforpeace initiatives in South Africa, Velosolutions has joined forces with Peschl Sports and the GO!Durban Cycle Academy to empower an all female team of young riders called “Velosolutions Izimbali”. Grade 11: Sithokozile Secondary School. I learned how to ride a bicycle when I was growing up through a friend who had a bike. Cycling Goals: What I wish to achieve as a growing cyclist is to travel around the world and represent my team, GO! Durban, my city and as well as my country South Africa. I love cycling because it has taught me that I can make a living from what I thought was just a hobby. 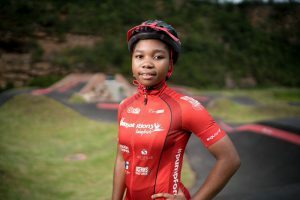 I think it is important for more girls to join cycling because we do not have enough black girls in this sport and it will help them not to do negative things. Future Goal: When I grow up I want to be a doctor because I love helping people who are sick and injured and because I am a very brave. I joined the GO! Durban cycle academy in 2016 and that is when I got my first bike lesson. Cycling Goals: My goals in cycling are to make it into the SA Women’s National Team. I love cycling because it keeps me fit and flexible. I love the bike park because it is where I spend time with my friends when I am not at home doing house chores. I think it is important for girls in my community to join our cycling academy because they will learn new skills like commitment, communication, as well as life skills that will guide them in their journey of life. It will also motivate them to keep their grades high at school like I do. 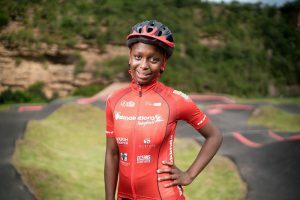 Future Goal: When I grow up I want to be a professional cyclist and work for an organization like GO!Durban to pass the batton of my cycling skills to the young upcoming cyclists. I learned to cycle at an early age when my dad introduced me to a bike when I was 5 years old. He motivated me to join the GO!Durban cycle academy in August 2017 as he could see the passion I have for cycling and he knew the bike park is safe and I would learn more as I was limited by the environment of cycling on the street. I love cycling because it fulfils me and it is the one thing that completes me. When I’m on a bike I feel fearless, happy and powerful, like I can take over the world. Cycling Goals: My goals in cycling are to learn and train more in order for me to be the best amongst the best and pave my way to being a professional in this sport. I think more girls must come and join GO! Durban cycle academy because at the bike park we not only learn about cycling, but there are other things too, like we have academic classes where we are taught English, we learn different values, and they even help us with school work. Future Goal: When I grow up I want to be a nurse because I love helping people and seeing them living a longer healthy life. My second option is to become a pro female cyclists because I will make money while living my dream. I was introduced to a bike when I was 4 years old and I taught myself how to ride it. I have never looked back since then because even in my primary school years I was good at it. I joined the GO! Durban cycle academy in July 2017. Cycling Goals: My goals in cycling are to learn doing different tricks and make history by racing on an international level. I love cycling because it gave me strength and bravery to express who I am. Growing up I was shy and I couldn’t talk to people easily, but after coming to the bike park I am now able to talk to anyone without hesitation. 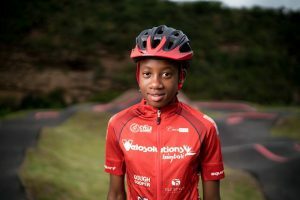 It’s important for girls in my community to join our cycling academy because they will get exposure to so many opportunities that they never knew or thought they can even get. Cycling will keep them safe and away from doing bad habits that will destroy their future.